It presumably surprised no one that Channel 7’s hype-department went into overdrive at the prospect of another blockbuster match between Novak Djokovic and Stanislas Wawrinka. As with all commercial television networks, Australia’s tennis broadcaster subscribes to the crude conceit that any memorable event must inevitably be repeated if even a few of its defining conditions are present. In this case the defining conditions were the players involved and the best-of-five format. These men played two five set classics last year, and according to Channel 7 this ensured their next effort was destined to be another. Being steadier and wiser, I wasted no opportunity to inform anyone near me – family members, buskers, stalkers – that there is more to professional tennis than the Majors, and that Djokovic easily dispatched Wawrinka twice at the end of last year, in Paris and London. Only an unredeemed ignoramus, I maintained, would expect another classic. Djokovic would win easily. My son, who has decided that he and Djokovic are going to become friends, was particularly thrilled by this news. As it transpired, the match was a classic. Channel 7 was right, and I was wrong. That may not be the hardest sentence I’ve ever had to write – ‘Mr Becker, I regret to inform you that your brain condition is inoperable.’ – but it’s certainly on the shortlist. At least for the first set, it looked as though I’d be proved right. Djokovic was looking exactly like the guy who hadn’t lost a match of any kind since the US Open final in September, who was currently enjoying the second longest Grand Slam semifinal streak in the Open Era. Wawrinka meanwhile looked like he couldn’t quite work out where his baseline was, or why it was important that he position himself closer to it. He figured it out in the second set however, though it still came as a surprise to everyone in the stadium when he finally broke Djokovic, and served it out. Crowd sympathy within Rod Laver Arena had slightly favoured Djokovic as the players sauntered on to court, though it could have been that the Serbian fans were more punctual. 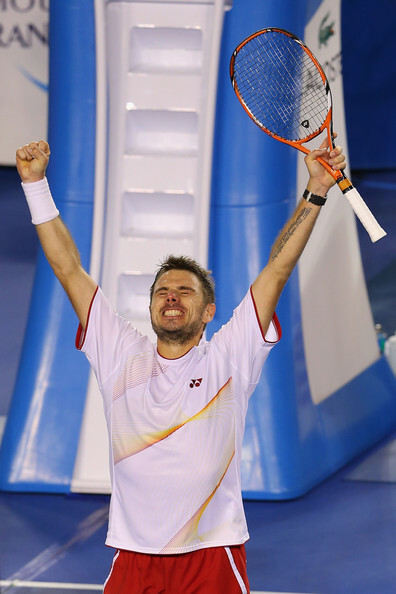 By the time Wawrinka broke in the third set, twice, there was no doubt which man the crowd preferred. Djokovic was too content to rally with the Swiss, especially crosscourt on the backhand, and rediscovered that this shot doesn’t break down the way other single-handers can. Nonetheless, Djokovic took the fourth comfortably, and broke at the start of the fifth. A reprise of their US Open appeared more likely than their extravagant 12/10 effort from Melbourne last year. Then, for reasons ungraspable by rational minds, Djokovic compiled a service game of cosmic awfulness, sturdily mounted on four forehand errors, and was broken back. Both men settled into a long sequence of holds, interrupted briefly by a rain delay. Djokovic went back to holding comfortably. Wawrinka did it harder, but, somehow, legs and mind constricted, he did it. Blithely ignoring the concept of momentum, he finally broke Djokovic with the Serb serving to stay in the match for the fourth time, at 7/8. Djokovic’s brain-wave to serve-volley on match point down has already blossomed into legend. To volley was, to put it mildly, a rash choice, and it was rashly played. He swung at it, pushed it wide, and the three-time defending champion was out. He left the court to a wave of warm regard, which heated to radiant affection once Wawrinka’s took his chance to speak. He pronounced himself ‘very, very, very, very happy.’ He’d proved me wrong, but in the moment I found it hard to begrudge him his joy. My son was less impressed when I told him the result, but learned a vital first lesson in parental fallibility. It had to happen some time. I won’t complain if he gains something of Djokovic’s perfect grace in defeat, but I do dream he’ll somehow acquire a backhand like Wawrinka’s. If he falls in with a bad crowd, he may end up with a backhand more like Grigor Dimitrov’s, a fate no parent would wish upon their child. For the first set of today’s match between Dimitrov and Rafael Nadal, the Bulgarian did an excellent job of shielding his backhand wing from the Spaniard’s merciless attention. Mostly he did this by breaking early and serving well. This was an unusual match, easily the strangest of the round; not particularly enjoyable to watch, nor, from what I could tell, to play. It boasted little of the drama of Djokovic’s loss to Wawrinka, and none of the quality. Nadal began poorly and never hit full stride. Dimitrov began well, but immediately subsided into woeful inconsistency. He broke early, but thereafter could barely land a return, and saw out the first set on the strength of his first serve alone. Breaks were donated and whimsically regifted in the second set. Nadal sought to fire himself up, and succeeded in whipping the crowd into some sort of startled frenzy through the sheer force of his personality, or at any rate the lustiness of his bellows, which for duration and incongruity were a fitting homage to the departed Djokovic. Either man could have taken the second set, but naturally only Nadal did, with a lovely combination of passes. The third set was more or less the second set with all the settings dialled up. Breaks each way, flailing inefficiency from both men – Nadal’s serve in particular was heavily affected by a blister on his left hand, which Channel 7 took great delight in showing in dynamic detail, with Spidercam swooping in – an expertly curated selection of beautifully framed forehands, and the inability of both men to sustain pressure. This point from the third set tiebreak encapsulates the overall dynamic quite perfectly: Dimitrov’s tweener lob is the brilliant moment fated to resonate, but observe how once he has re-established himself in the rally he undoes his good work with a sequence of weak, short backhands. Nevertheless, Dimitrov had three set points in total, including one on his own serve. It was a big serve, too – 205kph out wide – leaving him with an attractively pristine acre of court to hit into, or out of, as it transpired. That forehand miss will certainly stay with him for a long time. It was certainly still on his mind in the press conference, as he shed hot tears of frustration. Nadal later admitted to Jim Courier that he’d simply been lucky in that moment, with a relief that had hardly faded in the intervening hour. The fourth set saw Dimitrov fade in the usual manner. He hadn’t played especially well, though he had fought well, and his tournament was over. If he’d been able to land those forehands it might have been a different match, though probably not a different result. If he’d been able to regulate the depth on his backhand better, it certainly would have been. Nadal will face Roger Federer in the second semifinal, another instalment in the most famous rivalry in the sport, an exalted status reflected in its recourse to roman numerals. This will be their XXXIIIth meeting. Whereas last year’s matches were dominated by Nadal, there is some reason to believe that Friday’s meeting will be more competitive. Federer, with his new racquet and mended back, is back to playing the kind of aggressive tennis he was once famed for, at least for the opening sets of each match. After that his boldness erodes sharply. Two rounds ago he tore through Blaz Kavcic in fearsome fashion, before the third set devolved into an unnecessary dogfight. The same pattern threatened to recur in the fourth round against Jo-Wilfried Tsonga; that it didn’t owed mostly to the Frenchman’s sense of timing, which is not commensurate with his sense of occasion. Tsonga left his run too late, and Federer was permitted to coast over the line. Andy Murray almost committed the same mistake, only coming truly to life as Federer served for the match at 5/4 in the third set. Federer commenced in majestic fashion, his forehand and serve both devastating, his backhand impenetrable and his excursions into the forecourt frequent and decisive. Murray had ambled to the quarterfinals thanks to the most generous draw since, well, his last Australian Open. Federer was thus his first true test, not only of the tournament, but since last year’s US Open. He missed four months of tennis, and last night appeared fatally short of big match practice. I’m not sure anyone besides those ardent Federer fans who exist in a state perpetual anxiety truly expected Murray to maintain a high level for long enough, in perfect contrast to last year’s semifinal. On paper it was the most appealing of all the men’s quarterfinals, but when it came down to it the stakes somehow didn’t feel very high. The Scot finally found his feet in the second set, like Wawrinka the night before forcing himself to venture up onto his baseline. Federer continued to be aggressive, and this was probably the best period in the match, until Murray threw in a poor game to be broken. We can put this lapse down to shortage of match play, but Djokovic had already proved that even the best players don’t really need a reason. Federer served out the set. The third was much the same, with the Swiss entirely untouchable on serve, at least until he stepped up to serve for the match, and thoughtfully reminded us that pressure has internal obligations of its own. Federer tried to coast over the line, but Murray, to his enormous credit, was having no part of it. Invited to step in, he did, heavily augmenting the pace on his groundstrokes, and forcing Federer into error. Federer gained a couple of match points in the tiebreak, and once more reverted into passivity, and was made to pay. The fourth set began in much the same manner – Murray’s first service game lasted about a quarter of an hour, and saw Federer gain half a dozen break points, which he mistook for an ideal opportunity to work on his sliced forehand returns. His personal challenged appeared to be to see how many of them he could bunt onto Murray’s service line. It turned out to be a lot. Murray by this point was largely spent, his first serve shorn of pace, and his movement to the forehand corner sluggish. But he was rarely stretched, and made the most of his opportunities to move forward. Federer finally attacked a forehand return on a break point late in the set, and was presumably the only person surprised to learn that this markedly enhanced his chance of winning the subsequent rally. Obliged once more to serve it out, he fell quickly to 0-30, but extricated himself with a bold rally and a brave second serve, before taking the match a few points later. Afterwards, forced to explain himself to Courier, he sounded about as relieved as Nadal had, though one was left to wonder if he realises just how weighed-down he lately seems by pressure. At times this tournament he has looked like his old self, not merely the statesman who returned to number one in 2012, but the reckless youth who dominated the world in 2006. At other times, however, he has looked exactly like a man who has learned by heart the lesson that all things must pass, that one’s moments of greatness don’t become less precious the more of them you’ve accumulated, but more precious the fewer of them you have left. Equally hard, imo: Mr. Djokovic feeling the need to entertain the tennis world impersonating Mr. Becker, to the delight of said tennis world. Here’s hoping he doesn’t keep it up. Part of me wants Becker to hang around, just to see what happens. The other part of me wants what’s best for Djokovic. Here’s hoping the various parts of Djokovic himself do find some comfortable meeting space somewhere. Thanks for the smiles, thanks for the emotions. I’m so greateful to be born in the era of your tennis writing! Well, thank you. I’m very flattered. And I find I can no longer make robot jokes about Berdych. Like Pinocchio, he has finally become a real boy. Very late of course, but this, ” At other times, however, he has looked exactly like a man who has learned by heart the lesson that all things must pass, that one’s moments of greatness don’t become less precious the more of them you’ve accumulated, but more precious the fewer of them you have left.”..is just especially brilliant. And not a little heart breaking for a Fed fan. Thanks. That was won of those rare nice lines that just came, and didn’t require endless revision.